Largest city in the state of Missouri, U. S. A. Its pioneer Jew was Wolf Bloch, a native of Schwihau, Bohemia, who is reported to have settled there in 1816. The early arrivals probably intermarried and in this way lost their identity; for it was not until the Jewish New-Year of 1836 that the first religious services were held, when ten men rented a little room over a grocery-store at the corner of Second and Spruce streets. The next year these pioneers organized the United Hebrew Congregation, which is still in existence. A. Weigel was its first president; and services were held for many years at a private house in Frenchtown. The first building used as a synagogue was located on Fifth street between Green and Washington avenues. In 1855 this organization bought a site and erected its own temple on Sixth street between Locust and St. Charles streets. The building was consecrated June 17, 1859, the Rev. M. J. Raphall of New York officiating. The rabbinate has been held by the Rev. Henry J. Messing for the past twenty-six years. The B'nai El congregation was organized in 1840, and moved into its own house of worship at Sixth and Cerre streets in 1855. The Rev. Moritz Spitz, editor of "The Jewish Voice," is the present (1905) occupant of its pulpit. In 1866 Shaare Emeth congregation was organized, with Rev. S. H. Sonnenschein as its spiritual leader, and Alexander Suss as its first president. The Rev. Samuel Sale is the present rabbi. In 1886 a number of the members, being dissatisfied, banded together, and with Rabbi Sonnenschein organized Temple Israel, with Isaac Schwab as president. Dr. Leon Harrison is the present spiritual adviser. There are also six regularly organized Orthodox congregations in the city. In 1844 A. J. Latz purchased a lot on Pratte avenue for a cemetery, which was used until 1856,when the United Hebrew Congregation acquired what is now known as Mount Olive Cemetery. The B'nai El congregation used as its first burial-ground a plot of land on Gravois road, now enlarged and known as Mount Sinai. This land was purchased in 1849. Later the Mt. Sinai Cemetery Association was formed, and the corner-stone of its chapel was laid June 22, 1873, the Revs. Wolfenstein and Sonnenschein officiating. The members of B'nai El, Shaare Emeth, and Temple Israel congregations are entitled to burial in these grounds. The I. O. B. B. gained an early foothold in St. Louis, Missouri Lodge, No. 22, having been organized in 1855, and Ebn Ezra Lodge, No. 47, in 1863. Both lodges are still in existence and have large memberships. Progress Lodge, No. 53, of the Independent Order of Free Sons of Israel, a beneficiary organization, was founded Sept. 6, 1872. As early as 1857 St. Louis had its social organization, the Harmonie Club beginning its existence at that time, with M. Hellman as its first president. Its club-rooms for fifteen years were on Market street between Fourth and Fifth streets. In 1872 the Concordia Club, with Leopold Steinberger as its presiding officer, was organized. Both of these bodies have passed out of existence, and the Columbian Club is now the only distinctly Jewish social institution in the city. Jacob Meyer was its first presiding officer (1892). One of the prominent characters in St. Louis during the Civil war was Isidor Busch, a wine-merchant. He was one of the delegates on the "Unconditional Union Ticket" to a convention which decided that Missouri should remain in the Union. After the Chicago fire in 1871 many Jewish families removed from that city to St. Louis; and these required temporary assistance. It was then that the United Hebrew Relief Association was inaugurated, with B. Singer as president, and Rev. S. Wolfenstein (now superintendent of the Cleveland Orphan Asylum) as vice-president. Numerous charitable organizations sprang up from time to time until 1897, when the first consolidation was effected. The United Hebrew Relief Association, the Sisterhood of Personal Service, the Ladies' Zion Society, and the Hebrew Ladies' Sewing Society combined, with a view to more effective work, under the name "United Jewish Charities," with Moses Fraley as president. The Hebrew Free and Industrial School Society, an organization for the instruction of children in Jewish history and religion, was founded by the Rev. H. J. Messing in 1879, with J. B. Greensfelder as president; and the Jewish Alliance Night-School for immigrants was established a few years later by Prof. W. Deutsch, and was presided over by Elias Michaels. The Home for Aged and Infirm Israelites was founded in 1882, with B. Hysinger at its head. It owns the property which it occupies, and provides for about fifty inmates. The United Jewish Charities being in need of funds in 1898, a large fair was held for one week in the Coliseum of the Exposition Building, under the auspices of a special committee presided over by Julius Lesser, with the result that the Charities received the sum of $37,000, one-half of which was appropriated toward the relief fund, while the remainder was used for erecting a building to be used by the Jewish charitable and educational bodies of St. Louis. The title to this building is vested in the United Jewish Charitable and Educational Associations, the first president of which is Elias Michaels. 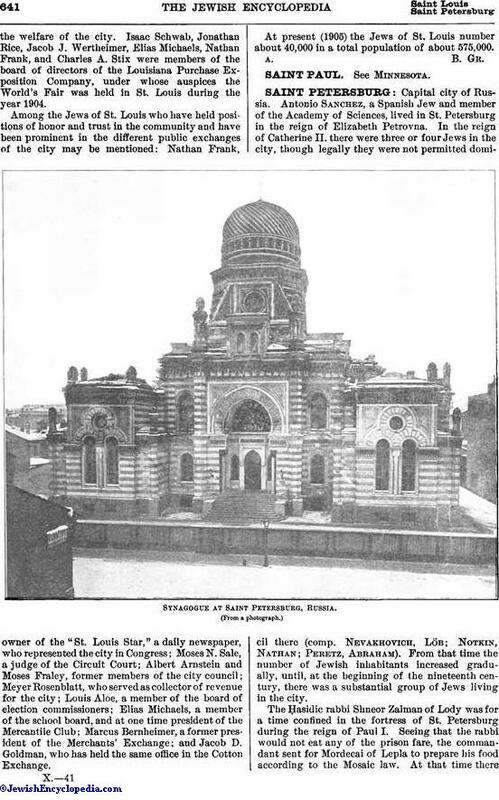 Realizing the need of a hospital for the poor, the Jews of St. Louis contributed a fund of $100,000, which was paid to The Jewish Hospital of St. Louis, incorporated in 1900, and presided over by August Frank. The spirit of consolidation which was prevalent during the year 1901 affected those Jews who were interested in the several charitable and educational institutions of the city, and who believed that by a stronger union more work could be accomplished and larger contributions secured. Accordingly on Nov. 7, 1901, a committee of 100 persons assembled at the Columbian Club, and it was decided to organize the Jewish Charitable and Educational Union, with Moses Fraley as president. 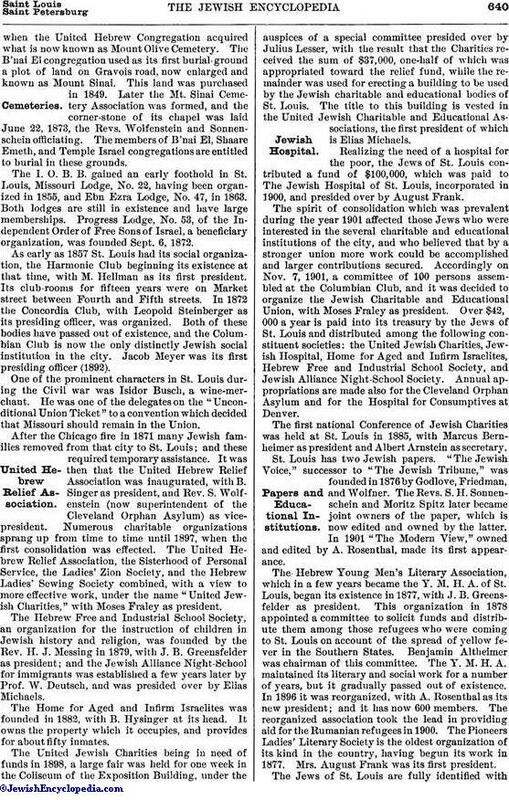 Over $42,000 a year is paid into its treasury by the Jews of St. Louis and distributed among the following constituent societies: the United Jewish Charities, Jewish Hospital, Home for Aged and Infirm Isralites, Hebrew Free and Industrial School Society, and Jewish Alliance Night-School Society. Annual appropriations are made also for the Cleveland Orphan Asylum and for the Hospital for Consumptives at Denver. The first national Conference of Jewish Charities was held at St. Louis in 1885, with Marcus Bernheimer as president and Albert Arnstein as secretary. St. Louis has two Jewish papers. "The Jewish Voice," successor to "The Jewish Tribune," was founded in 1876 by Godlove, Friedman, and Wolfner. The Revs. S. H. Sonnenschein and Moritz Spitz later became joint owners of the paper, which is now edited and owned by the latter. In 1901 "The Modern View," owned and edited by A. Rosenthal, made its first appearance. The Hebrew Young Men's Literary Association, which in a few years became the Y. M. H. A. of St. Louis, began its existence in 1877, with J. B. Greensfelder as president. This organization in 1878 appointed a committee to solicit funds and distribute them among those refugees who were coming to St. Louis on account of the spread of yellow fever in the Southern States. Benjamin Altheimer was chairman of this committee. The Y. M. H. A. maintained its literary and social work for a number of years, but it gradually passed out of existence. In 1896 it was reorganized, with A. Rosenthal as its new president; and it has now 600 members. The reorganized association took the lead in providing aid for the Rumanian refugees in 1900. The Pioneers Ladies' Literary Society is the oldest organization of its kind in the country, having begun its work in 1877. Mrs. August Frank was its first president. The Jews of St. Louis are fully identified withthe welfare of the city. Isaac Schwab, Jonathan Rice, Jacob J. Wertheimer, Elias Michaels, Nathan Frank, and Charles A. Stix were members of the board of directors of the Louisiana Purchase Exposition Company, under whose auspices the World's Fair was held in St. Louis during the year 1904. Among the Jews of St. Louis who have held positions of honor and trust in the community and have been prominent in the different public exchanges of the city may be mentioned: Nathan Frank, owner of the "St. Louis Star," a daily newspaper, who represented the city in Congress; Moses N. Sale, a judge of the Circuit Court; Albert Arnstein and Moses Fraley, former members of the city council; Meyer Rosenblatt, who served as collector of revenue for the city; Louis Aloe, a member of the board of election commissioners; Elias Michaels, a member of the school board, and at one time president of the Mercantile Club; Marcus Bernheimer, a former president of the Merchants' Exchange; and Jacob D. Goldman, who has held the same office in the Cotton Exchange. 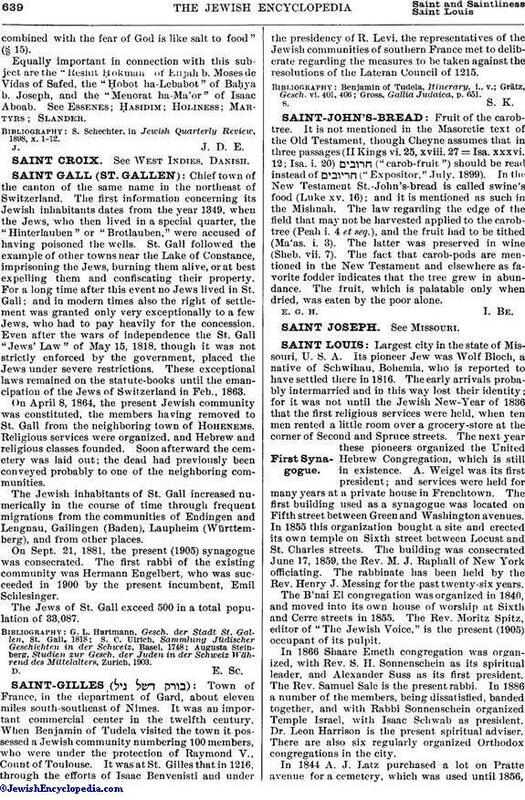 At present (1905) the Jews of St. Louis number about 40,000 in a total population of about 575,000.